Starting a new job is always an exciting time; new office, new faces and a whole new world of processes to wrap your head around. This has been my first month at Oxford Consultants for Social Inclusion and quite an introduction it’s been! It is a wonderful feeling to be able to step into a workplace filled with dedicated and passionate people; using their skills to work together to deliver useful services. Taking time to find out about everybody’s roles has been really eye-opening and it is a great insight into the well-oiled machine that is OCSI. This month I have been looking at the ins and outs of Community Insight; the community mapping tool designed for housing associations and developed in partnership with HACT. Earlier this month, we held a User Group for Community Insight users, running through the recent updates. It was great to hear so many stories of how the tool is benefiting organisations – and their communities! I am looking forward to supporting our users with this tool, and finding out even more about the ways in which it is making a difference in communities around the UK – that sounds like a future blog topic right there! I have also been busy getting to grips with OCSI’s social media – which Dan (one of the OCSI team) has been doing an excellent job of keeping on top of. We use our social media as an information sharing platform, as well as to keep followers up to date with what we’re up to. If you haven’t done so already, be sure to follow us @ocsi_uk for tweets on open data and open government, measuring & tackling poverty and deprivation, social impact, data visualisation, our projects and more. There are lots of other exciting projects on the go at OCSI, and through our daily ‘stand up’ meetings and bi-weekly Sprint meetings (part of the Agile project management system we use – a separate blog on this at a later date), you get a really useful glimpse into what is going on around the organisation. – Continual improvement to our community mapping tools: We spend a lot of time refining the tools, in order to ensure they are working in the best way possible for our users. On top of this, the data used by these tools is constantly being updated. – Work with the US collecting data to better catalogue health information: The research team are working on a US initiative to make state by state health data available at small area level to local counties. US data packs involves the collection, formatting and processing of large quantities of county level health data – for hundreds of requested indicators – which are then cleaned and stored in our database and distributed for use to states and counties as they commission it. – Updating data packs: Our data packs, which support local public agencies to manage their Local Information Systems better, use the most up to date public data available. So along with the community mapping tools, the data packs also need a little love and attention to ensure we are providing the most relevant information to inform better decision making. Now I am settled in to the routines and rhythms of OCSI, I’m looking forward to getting my teeth into various projects – including a revamp of the OCSI website (watch this space), more blog posts and video tutorials for our community mapping tools. 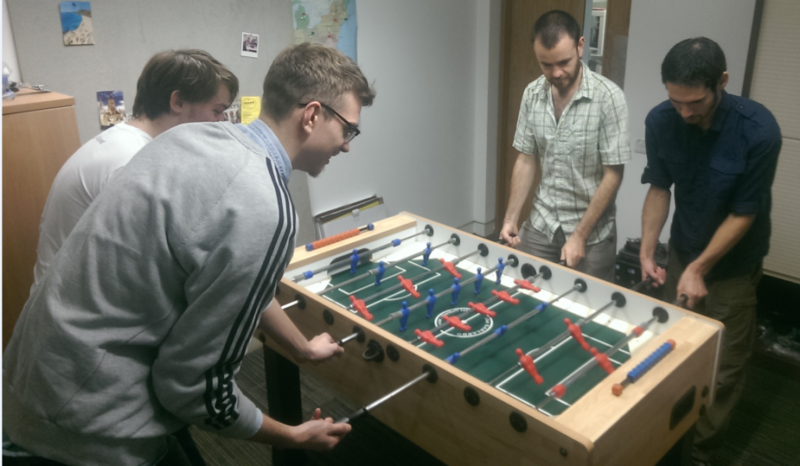 With all this going on, it is soothing to know that we can take a break for a quick game of team table football. The phrase ‘work hard, play hard’ springs to mind. We have some pros in the OCSI office, so I will be watching a few YouTube videos to refine my skills in the near future. An exciting note to end on. This month, I am not the only new member to the OCSI family. We also welcomed the arrival of not one, but two OCSI babies – in the same weekend! So, congratulations to Stefan and Graham to the wonderful new additions to your families.